Robocraft Infinity Xbox One Public Beta announced! Are you an Xbox Insider? Would you like to test your robot building skills? 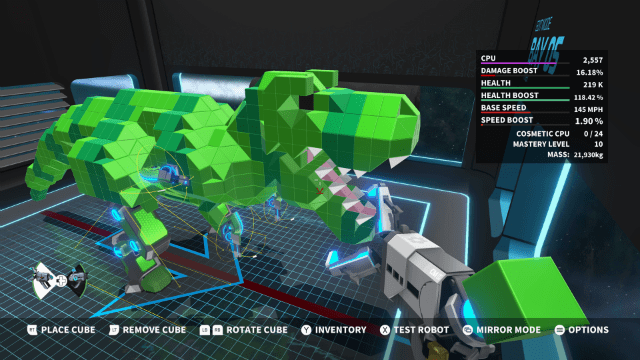 The Robocraft Infinity Public Beta on Xbox One will let you do just that! Announced today by Freejam is the first large scale Robocraft Infinity Public Beta. After huge success on PC with the original Robocraft in 2013, Freejam will be delivering Robocraft Infinity exclusively to Xbox One in Q1 2018 and this public beta will not only give us all a first taste of the game, but the chance for Freejam to sort out any issues prior to the launch. Taking place from Friday 16th March at 12:00 UTC thru to Monday 19th March at 12:00 UTC, you can secure your place in the Beta by signing up via the Xbox Insider Hub app, heading to ‘Insider Content’ and grabbing Robocraft Infinity. Access will then be granted on a first come, first served basis once servers open on Friday. But what is Robocraft Infinity? Well, it gives us the opportunity to build the most awesome of robots block-by-block, before taking them into battle against fellow creators online. Jet cars, tanks, flying warships, helicopters, drones, dinosaurs, scorpions – anything is possible to build and because you’ll never know who and what you are going to face, no two battles are ever the same. The beta test will feature the complete editor toolset plus two different 5v5 multiplayer game modes – Team Deathmatch and the capture point-based Battle Arena. You’ll also be able to upload and share your robotic creations for free via the Factory. Robocraft Infinity will launch exclusively for Xbox One this Spring. For a bit of a rundown on how to start out with the game, Freejam recently released a ‘Getting Started’ video featuring community manager ‘NoddyDog’ to help ease you in. Check it out below as you wait for Friday to roll around! 呢D game好難work....要砌太耐先至可以砌啱心水, 如果用stock果堆又冇意思.... 打下AI還好, 但pvp對戰....怕且唔駛講平衡度了.